At least three possibly illegal political mailers are being sent to voters around the state of New Hampshire in an effort to depress the vote for U.S. Sen. Kelly Ayotte, R-NH, on Nov. 8, 2016, by getting conservatives to cast ballots for Aaron Day, an independent in the race. The mailers – professionally designed and mailed from New Jersey – target Ayotte for saying that she wouldn't vote for GOP presidential candidate Donald Trump and claimed that she backs gun control legislation with Democrats in the Senate. The mailers include quotes from Trump criticizing Ayotte and a "NRA-ILA" logo that was sloppily pasted onto the graphic, making it look like it was paid for by the National Rifle Association. They also include positive comments about Day, a liberty Republican turned indie. The mailers state that Day "firmly opposes Obamacare" and was "a strong supporter of the (c)onstitution and the constitutional right to bear arms" – clearly attempting to sway voters to the conservative indie in an effort to boost the campaign of Hassan...The mailers did not include a return address, disclaimer, or acknowledgement of finance, which, even though it doesn't endorse any candidate, appears to be a violation of 52 U.S.C. 30120(a)(3), which requires acknowledgement of who or what paid for all political advertisement[s]. Two dark money mailers sent to thousands of voters without any disclosure of who paid for it—a likely illegal act—were sent by the same St. Louis printing company, which has been used by many Democratic campaigns in the state this cycle. The two mailers—the first one targeting Republican representative Ann Wagner and the second targeting Republican Senate candidate Josh Hawley—both lack the standard disclosure statement identifying who paid for them, earning them quick criticism from state Republicans. The Wagner campaign immediately called the mailer targeting the congresswoman illegal and said it would be filing a complaint with the Federal Election Commission. The Missouri Republican Party similarly called the mailer targeting Hawley illegal and called on his opponent Sen. Claire McCaskill (D., Mo. ), a frequent critic of dark money groups, to condemn the mailer...Dark money mailers like the ones targeting Wagner and Hawley have been a frequent target of McCaskill. 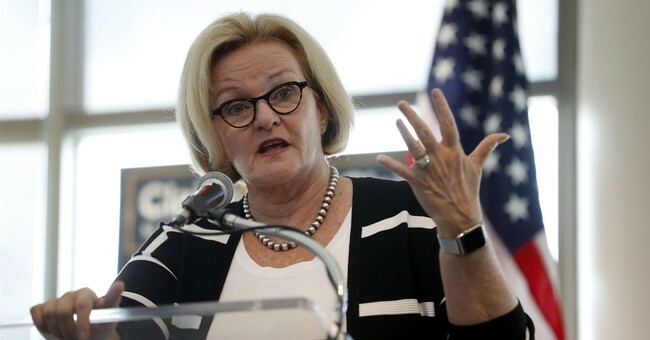 State Republicans have called on her to denounce the mailer...McCaskill's campaign did not respond to a request for comment. Similar direct mailers without disclosures have been sent in recent days targeting Republican Senate candidates in Montana and Indiana, both considered to be hotly contested races. Libertarian Rick Breckenridge bowed from the U.S. Senate race on Wednesday and threw his support behind Republican candidate Matt Rosendale, saying he was standing up against “dark money” in politics. Breckenridge said he was angry about a recent anonymous campaign mailer that said if Rosendale were elected, it would lead to more government surveillance and that voters should cast votes for Breckenridge instead...Breckenridge said he expected to get 3 percent to 4 percent of the vote in Tuesday’s election, which includes Democratic incumbent Sen. Jon Tester, and that his campaign has spent about $3,000. “I can’t compete with $50 million Madison Avenue campaign pieces,” he said. "I am here to support Matt and his candidacy,” Breckenridge, a surveyor, said during the news conference. “And to support him in the continuing effort to be the front man in the cause of liberty.” Rosendale thanked Breckenridge. "I am honored to have endorsement of Rick Breckenridge," he said. "I really appreciate him in joining me in (condemning) a dark money mailer that" he said was distributed by allies of Tester. Breckenridge will remain on the ballot, however, which could marginally assist Tester. It's important for right-leaning voters who may be skeptical of Republicans to be aware of these machinations so they're not inadvertently manipulated by the Left. That mail piece, and another one hitting Rosendale on trade policy, contain no “paid for by” disclaimers as required of any political committee sending such mailers. But they do list one key piece of information: the U.S. Postal Service code WC MLG 08899. The numbers are simply a ZIP Code—this one an area in Edison, New Jersey—but the preceding letters correspond to a specific sender. That doesn’t necessarily tell us who paid for the mailers, but it does suggest at the very least a common vendor with other recent mail pieces that have used the same code. In a memo released to reporters Wednesday, the Rosendale campaign identified the company Allied Printing Resources as its suspected culprit, citing its offices near Edison and its work with Democratic organizations this cycle and in the past—particularly the League of Conservation Voters, for which Allied produced direct-mail pieces backing Sen. Jon Tester’s 2012 re-election bid...Allied Printing didn’t respond to a request for comment. The company has worked this cycle with the Democratic Senatorial Campaign Committee and EMILY’s List, a high-dollar super PAC supporting Democratic efforts to retake the Senate. Whoever is behind the mailers is attacking other Senate Republicans in competitive races in like fashion. Nearly identical mail pieces in other races are missing information about who is paying for their distribution. Phil Kerpen also reminds us that Claire McCaskill used her allegedly ardent opposition to "dark money" as her excuse to oppose Justice Kavanaugh (and Gorsuch, by the way), yet here she is crossing her fingers that illegal dark money mailers will save her political skin by scaring conservative voters away from her Republican opponent.